Despite a heartbreaking loss by the Chiefs, one fan still had the night of a lifetime. It was the promise seen across the country in a story that went viral. 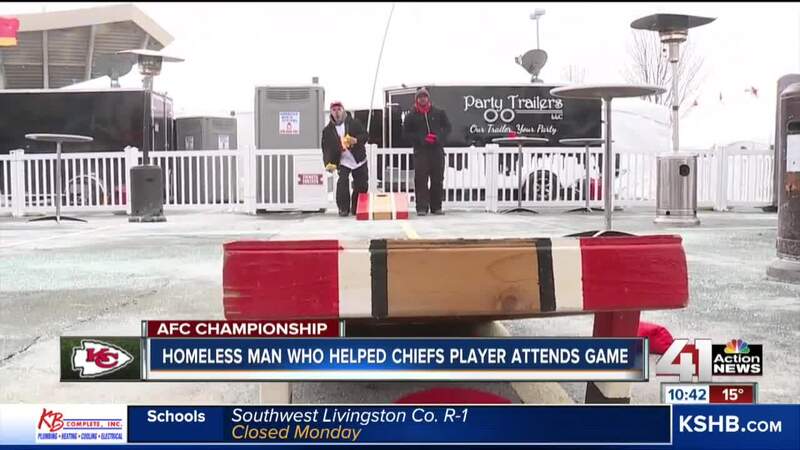 A random act of kindness sent a homeless man to the biggest game in Arrowhead Stadium history. KANSAS CITY, Mo. — Despite a heartbreaking loss for the Kansas City Chiefs, one fan still had the night of a lifetime. It was the promise seen across the country in a story that went viral. A random act of kindness sent a homeless man to Sunday's AFC Championship, the biggest game in Arrowhead Stadium history. It wasn't a happy ending for the Chiefs, who lost to the New England Patriots 37-31 in overtime. But Dave Cochran was still thankful to be there. "Its crazy, I have never been to anything like this in my life. I thank Jeff and his wife for blessing me with an opportunity to enjoy something like this,” Cochran said. Cochran helped Chiefs player Jeff Allen when his car got stuck in the snow on the way to Arrowhead Stadium for the AFC divisional match-up against the Indianapolis Colts . Allen then posted about the good Samaritan on social media, asking the public to help him figure out who it was so he could give the man tickets to the AFC Championship game. Cochran said he was just trying to do the right thing, not even knowing Allen was a Chiefs player at the time. He said he didn't expect his life to change in the big ways it already has. "I am nervous as all get-out. I have never been here, I have never been to a preseason game, or regular season, this is like a once-in-a-lifetime opportunity,” Cochran said. The community has wrapped its arms around him. Cochran will be the first to admit he has lived a life of crime. He has been arrested dozens of times since he was a teenager. But his act of kindness resulted in a hotel giving him a five-night stay, a glass company fixing the broken windows on his car, and thousands of dollars raised and clothes donated. Now, while the focus shifts from the Chiefs and back to reality, Cochran said he knows he will have to prove that he is turning his life around. "I got my sister. She is going to help me move forward with different activities to keep me busy, and I want to do some things for the community," he said.